> > of Atom cores, memory controllers, PCI-E, networking and SATA controller. > (though everyone is constrained by DRAM standard interfaces). Incidentally, that's one area where most ARM guys are far behind. If you look at the work that Intel, AMD, etc. have to do to get multiple DIMMs working for servers, it's incredible. The phone guys totally punt on that (and for good reason). It'll be interesting to see how Samsung's efforts turn out, in theory they should have a big advantage when it comes to memory controllers. > erosion of Intel's share. I just don't see prices going that low. Moreover, it's not clear that the differences will be meaningful in the context of the overall system. 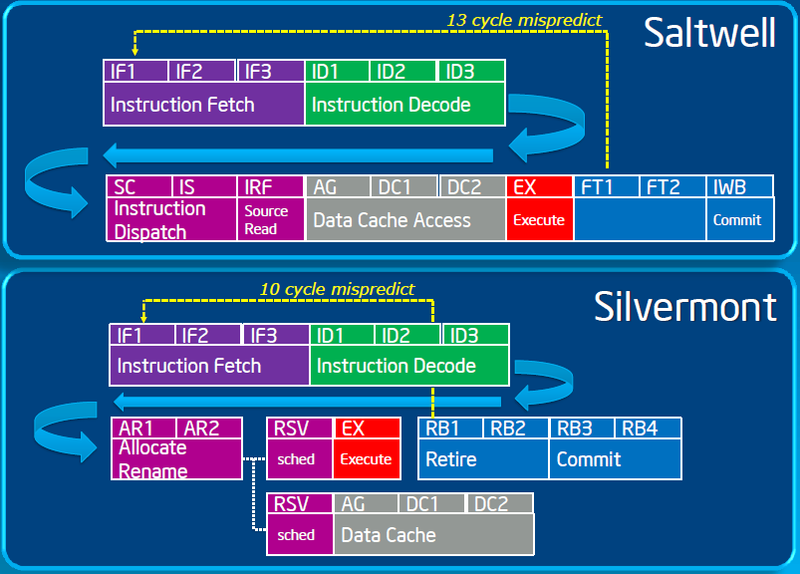 Memory is a pretty significant components, and both Tilera and Calxeda have pretty limited capacity. > > > ARM mobile-cpu business. > > > the ARM mobile space have probably already learnt that lesson. > > platforms, etc. and are subject to potential foundry delays. > I think they will get to be "good enough", even if they aren't quite there yet. Heck, even Qualcomm isn't there yet. They had huge problems with their supply chain, and they are one of the biggest ARM vendors out there. Smaller companies will suffer even more. > Relying on competitors to screw up is not a sufficient long-term strategy. > > > their own ultra-high-margin server cpu business before someone else eats it. > > > at much lower ASP and lower margin, if they're willing to accept that. > > really inexpensive and I don't see how an ARM vendor is going to compete well. > Those parts need a fan, a hefty power supply, a chipset, substantial board area etc. > they have "good enough" reliability and management features]. I agree, the best avenue for ARM servers to make inroads is by decreasing system cost for fans, etc. But that's something Intel and AMD can emulate. > > not like you can just use the same memory controllers for a cell phone and a server. > then it's quite possible that cellphone expertise is highly relevant). Cell phones have almost no memory. Ditto for Calxeda. OTOH, I think SNB-EP can talk to half a TB of memory? > of "good enough" and "really cheap" can be very successful. I agree. But I think the difference in cost between an ARM SoC and an Intel one is FAR smaller than say the P6 vs. PA-RISC circa 1995.